The carefully designed, uniquely kid-focused California Family Beach Yoga Retreat is a more memorable experience than that family vacation your sister-in-law mentioned. This unique family yoga retreat, featuring joint parent / child yoga, surfing, golf, and biking, allows parents and children to experience each other as teammates and equals on the beach having fun, and teaches your child or grandchild vital, lifelong lessons in mindfulness to help them achieve happiness in this stressful world, unlike most resorts' 'kids clubs', which segregate the parents from the children, and are nothing more than glorified daycare. Fun Fitness Globetrotters has as their base a spacious, thee-level beach townhouses with stunning ocean views in Pajaro Dunes, California, an exclusive neighborhood less than two hours south of San Francisco. Guests stay in comfortable, private en suite bedrooms equipped with bath amenities like shampoo and conditioner, bath gel, bath robes, slippers, and hair dryers, and enjoy the common living room, dining room, and outdoor decks with other clients. Pajaro Dunes also has tennis courts, beach volleyball, and bocce ball courts for guests to play around! Engaging and fun parent / child beach yoga led by experienced and friendly instructors is the cornerstone of this family yoga retreat. 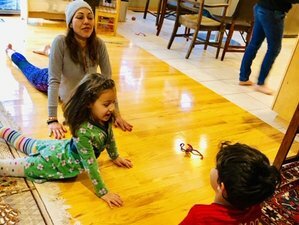 The benefits of yoga for your child are indisputable. According to a Harvard study, yoga improves a child's focus, self-esteem, academic performance, and reduces anxiety and stress. Each morning, the yoga instructor will lead a parent / child beach yoga class on the beach, personalized to each child and parent or grandparent, teaching your child safe and accessible yoga postures and basic meditation skills in a fun and engaging style. Each afternoon features a different joint parent / child activity, such as surfing class, taught by a California surfing legend and experienced surfing instructor; and a mountain biking session in California's spectacular Redwood Forest, led by experienced and fun mountain bike instructors. To complete your experience, this retreat also features a kids' beach ecology and marine art class with a renowned resident marine biologist, along with a kids' healthy cooking class, where parents are welcome to join! Parents and grandparents can choose from super fun retreat add-ons, like a 1-hour relaxing massage, or a fun beach horseback ride. Or relax on the beach with a glass of amazing California wines and a good book! Patricia is Fun Fitness Globetrotters' Head Yoga Instructor. She coordinates all aspects of the yoga program. She is certified 200 hours in Ashtanga yoga, and has over 16 years practicing and teaching yoga and guided meditation. Patricia considers every class an opportunity for guests to learn to activate the body with the movement and relax the body with breathing. Her classes can accommodate all levels of yoga training, from beginners to the advanced. ​All meals are included. You will enjoy delicious, locally-sourced organic food with lots of California's amazing fruits and vegetables. Unlimited bottled water, California wines, and morning coffee and tea service are also included. Fun Fitness Globetrotters is the leading provider of meticulously curated luxury yoga and fitness retreats all over the world.